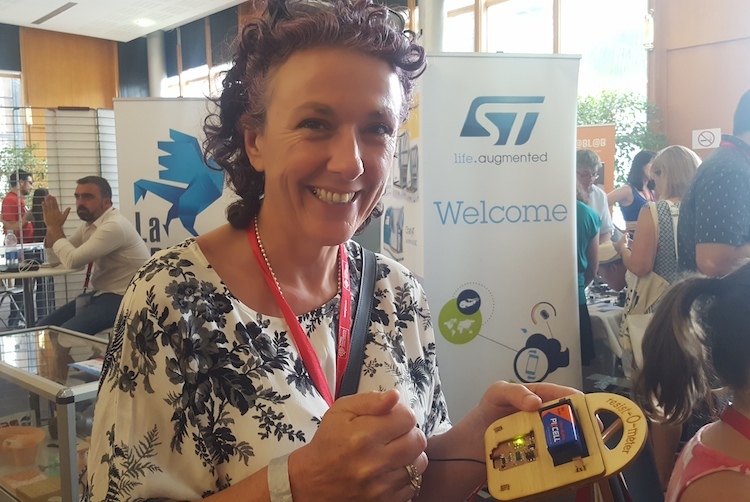 Pioneer makers and young graduates of the Fab Academy, veterans of FABX and novices of the international conference of fablabs, they all have one thing in common: they were at FAB14 Toulouse. Portraits of fabbers. 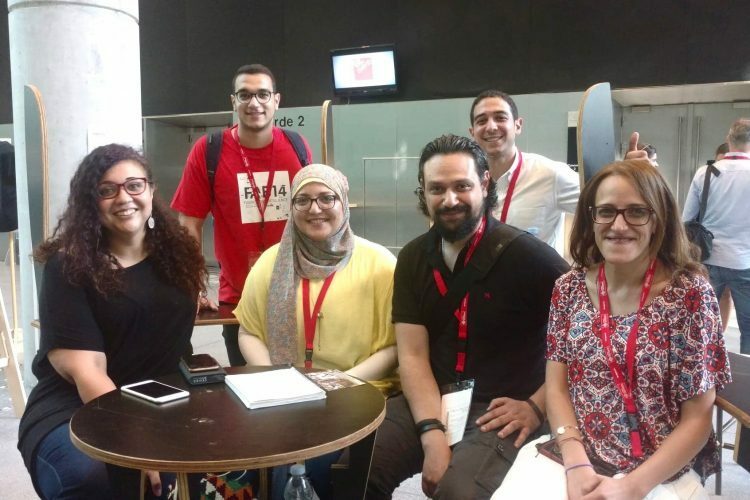 Egypt, which will host FAB15 next summer as the first edition of FABX in Africa, came to Toulouse as a group (of six, including volunteers Mohamed El Hossary and Mohamed Tarek, below). The Egypt delegation is on a mission: next year, it will be their turn to host the international meeting of the fablab community. From July 29 to August 4, 2019, makers will meet in El Gouna for talks around the theme “collectively independent”, then in Cairo for the Fabfest. If their pitch won last year, they believe it’s thanks to their country’s young and dynamic community, as well as a well-anchored spirit of making: “Egypt is one of the maker countries, and we consider ourselves to be the oldest makers in history,” says May El-Dardiry, engineer in charge of education at Fablab New Cairo. It will also be the first time that a Fabconference is hosted in the Middle East. “It’s not just for Egypt, it’s for all of the Middle East and Africa. 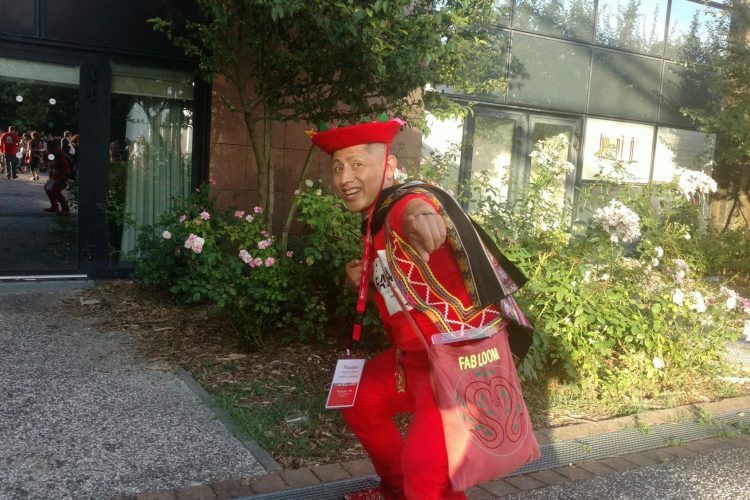 It’s also for the international community, so that people around the world can come and see what we have to offer,” say the organizers. The last edition of Maker Faire, organized in Cairo by Fab Lab Egypt, welcomed 10,000 participants, boasts May El-Dardiry. “The public is so diverse: artists, designers, amateurs, children, women… and men, of course, but we already know they exist!” joke the three female representatives of Egypt in front of their discreet male colleagues. 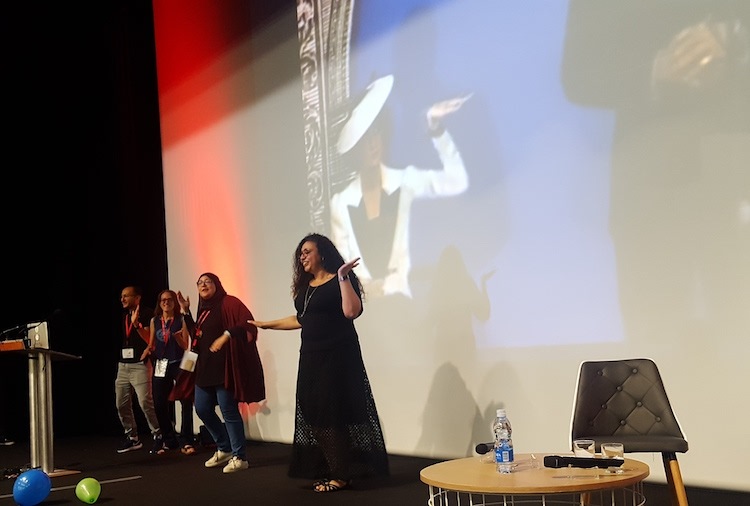 It was also the women who “walked liked an Egyptian” on the stage of the Convention Center at the very end of FAB14, as a symbol of passing the relay between France and Egypt. Wendy smiles, Wendy accompanies, Wendy explains: “When I press the pompon, the little light turns on.” In the more technical terms of this “DIY soft sensors” workshop, the (mostly female) participants sew on conductive (silver-based) fabrics in order to connect them to a multimeter and visualize their conductivity. Wendy is a designer and creative director of Fab Lab Wgtn in Wellington, New Zealand, where she promotes resilient practices through digital crafts. Laughing, she demonstrates the pompon connected to her homemade resist-O-meter: “It’s shaped like a handbag, because isn’t that more fun?” She designed this Soft Sensor-Tilt Sensor workshop based on the tutorials of Kobakant, “a great website full of DIY ressources,” she recommends. It’s a “simple, pratical and fun” way to get your hands wet in the world of smart fabrics. Wendy has made resilience her active and creative principle, which she is developing at Fab Lab Wgtn within the University of Massey through augmented crafts, recycled materials and a strong link with the fablab network—she is one of the mentors of the Fab Academy. On July 18, she cheerfully led the fabwomen’s Fabercise at FAB14, a moment of shared, energy-releasing calisthenics. Yet another way of promoting resilience, where participation involves both women and men, both the Antipodes and Europe. 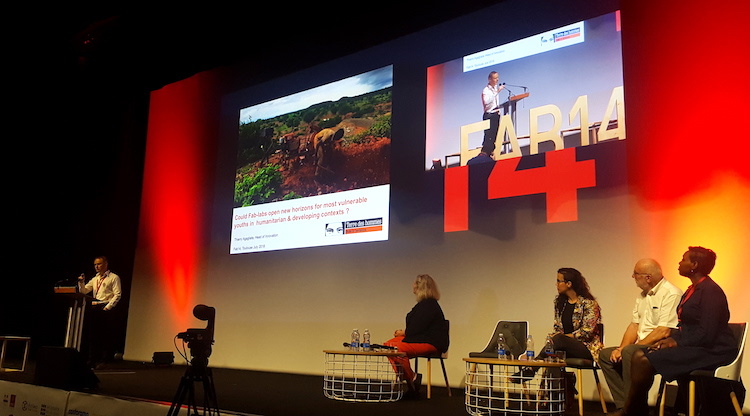 “The fablab is a new instrument with fantastic potential to do lots of things with children,” such as getting them out of mining exploitation, explains Thierry Agagliate at the symposium on access, on the last day of FAB14. Could the fablab be a tool for humanitarian action? As the head of innovation projects at Terre des hommes, a nonprofit organization that helps 3 million children around the world each year, Thierry knows what he’s talking about. Backed by a grouping of organizations and a proof of concept featuring the fablab opened inside the Syrian refugee camp in Ioannina, Greece, in 2017, Terre des hommes is making its next move with a new “broader” plan—to see how fablabs can serve development in the Gaza Strip, Burkina Faso, Ukraine and Kenya. It’s no coincidence that Thierry uses the vocabulary (POC) of makers: “We have yet to convince donors that it’s worth investing money in innovation,” he admits. But the success of the fablab in Ioannina is a good argument—from May 2017 to March 2018, he explains, 5,301 people have visited, of which 50.88% women and 93.4% refugees, with an average of 27 visits per day. He shows the photo of a young Syrian boy who passed through the fablab and is now studying mechanics in Germany. What about the fablab in Burkina Faso? Practically speaking, it will redirect children from gold mines, where 30% to 50% of the manual labor in gold panning sites are children (who go down wells, grind and handle very toxic products). The project, led by Ouagalab and the Humanitarian Fab Lab platform, “has just received a little financing from our innovation fund,” says Thierry, and will not be functional until “the end of the year”. He cites many “logistical challenges”: installing solar panels on the future lab near the artisanal mine in Nobsin in order to power it with electricity, bring in machines, secure an Internet connection, develop an alternative prototype to using mercury in gold panning by using a spiral concentrator… “We want to protect these children from working in the mine, but we know that the direction of the action will come from the children themselves, and that will reinforce resilience and social inclusion.” And if on this occasion an industry for ethical gold emerges, it would be yet more proof that a fablab can have a humanitarian reach (see the fabkit developed by David Ott and the Fab Foundation)! On the first day of FAB14, Walter Gonzales Arnao, a high-energy maker from Peru, distributes his book El impacto tecnológico en la artesanía peruana (independent publishing, not translated), about the impact of technology on Peruvian craftwork. With each copy, a selfie and a war cry. 300 copies later, the maker-author is still going strong. 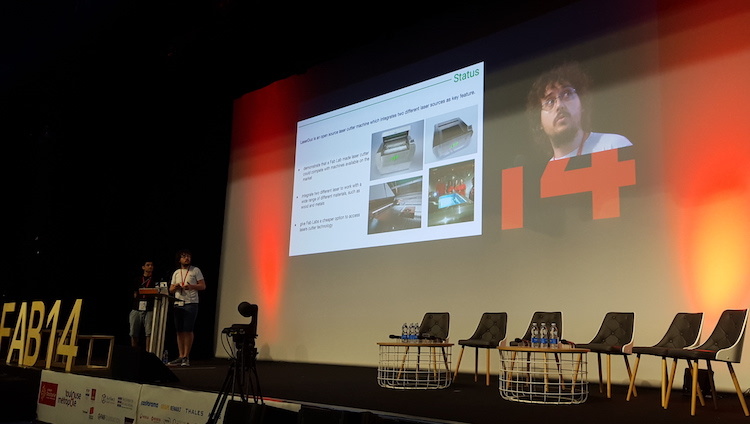 It’s just a glimpse of this ultradynamic and pioneering personality of the fablab movement, present at every international fabconference since FAB7 in Lima. The Peruvian loom-master maker currently holds 38 patents for inventions, 83 pending, 3 registered software licenses…He also founded the Fab Craft network to bring technology into the world of crafts. 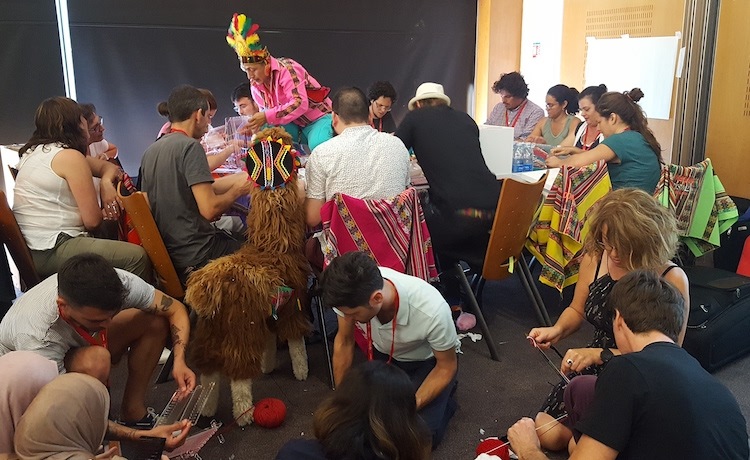 At FAB14, he gave himself entirely to his workshop on technology and Peruvian craft, standing/sitting/lying down on the table with llama in tow. 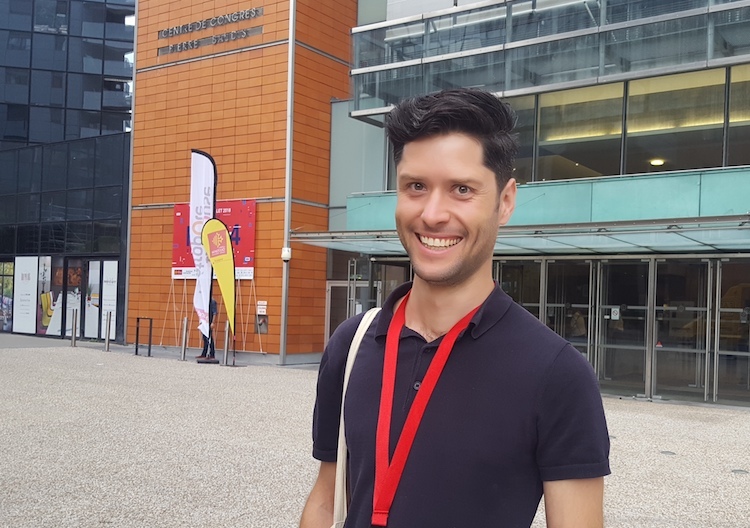 Maker of all trades and self-declared “dreamer”, Daniele Ingrassia, an Italian living in Germany, wowed the crowd at FAB14 with his chrome open source laser cutter…which we unfortunately didn’t witness in action. The IT engineer, AI researcher and Fab Academy graduate built this impressive machine, which he then spent the afternoon and following morning fixing…“Luckily, it was working when Neil [Gershenfeld] came by to see it,” he says smiling, not a bit worried. Makers from around the world offer helping hands (and hammers). The original project, which he developed at Fablab Kamp-Lintfort at the Rhine-Waal University of Applied Sciences, is to demonstrate that a laser cutter made in a fablab can hold its weight against commercial machines on the market, allow people to work with various materials (wood, metal) and give fablabs a cheaper option to access laser technology.” While he has already sold a Laserduo to a German university, Daniel is more focused on making it possible for fablabs to build their own machine, supported by workshops and demos. Even the controllers are open source, carried over from his final project for Fab Academy 2015, adapted and reworked with his students (and impressively documented).